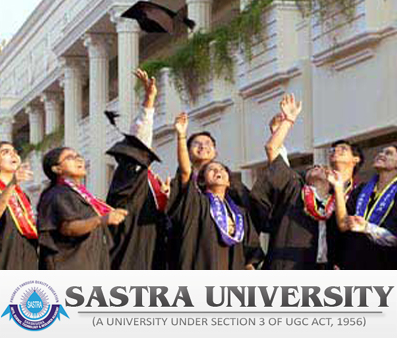 Sastra University B.Ed Admission 2019 (Distance Education) – Sastra University, Directorate of Distance Education offers admission to B.Ed (2 years) programme for the session 2019. The B. Ed. (Distance Mode) programme of SASTRA aims at making the in-service school teachers acquire relevant knowledge, skills and attitudes in pedagogical methods and preparing teachers to become role models in classrooms and to be an instrument for building productive human capital in our country to face the challenges of globalization. To create a comprehensive understanding of pedagogical methods in organizing learning experiences for students. To develop new skills required for teachers in organizing instructional methods through novel multimedia approaches. To enhance the skill of Technology of teaching in a virtual classroom. Latest: The last date of submission of application form for B.Ed. 2019 is now over! Sastra University has released notification for the admission in B.Ed for the year 2019. Last date for receipt of completed application form is February 28, 2019. Downloaded Application form with demand draft only will be accepted. Important dates are given below. The application form for B.Ed (2 years) programme for the session 2019 is now available. The forms are available, so Candidates are advised to download the B.Ed two years (distance mode) programme. Application Form can be obtained in person from the office of admission, SASTRA Campus (Thanjavur kumbakonam) on a payment fee or by Post through Demand Draft favoring SASTRA University, payable at Thanjavur. Application Form can also be downloaded from the official website of SASTRA University or from the direct link is provided below. Application process is now over! Note: Incomplete and late application forms, and also application forms furnishing false information will be summarily rejected without any information to the candidate concerned. Candidates are, therefore advised to fill up the relevant columns carefully and submit the form. Cost For Under Graduate Course is Rs. 300/-(in person), Rs. 350/- (Demand Draft). Demand Draft favouring SASTRA, payable at Thanjavur. Cost for Post Graduates Course is Rs. 600/- (in person) and Rs. 650/- if downloaded, with a Demand Draft favouring SASTRA, payable at Thanjavur. Cost for Diploma Course is Rs. 250/- (in person) and Rs. 300/- if downloaded, with a Demand Draft favouring SASTRA, payable at Thanjavur. Candidates should have successfully undergone the degree in 10+2+3 or 11+1+3 pattern of examinations in the following discipline from a recognized university. 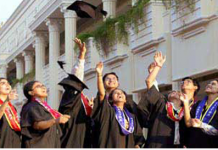 A Bachelor’s degree in B.A / B.Lit., /B.Sc., in Tamil / English / History / Geography / Physics /Mathematics / Applied Physics / Chemistry / Applied Chemistry / Bio Chemistry / Botany / Zoology / Microbiology / Biotechnology / Environmental Science / Dietetics/ Applied Geography / Computer Science / Computer Applications/ Information Technology. Note: In case of Economics/Commerce/Home Science the candidate must possess a Postgraduate degree (with a UG degree in the same subject) from the recognized University. Candidate must possess a teaching diploma from the NCTE recognized Teacher Education Institution through face-to-face mode are alone eligible. Trained In-Service teachers with two years full-time teaching experience in a Nursery / Primary / Secondary/ Higher secondary schools in Tamil Nadu recognized by the state or central Government. Should be currently working as a teacher in a government recognized school. One mark for each completed year of experience after two years of probation subject to a maximum of 20 years. The minimum experience being two completed full years and Continuance in service. B. Ed. programme is of two years duration. In any case, the programme will have to be completed within a maximum period of four years after enrolment. Rs. 63,000* to be paid in one installment for the entire two-year programme at the time of admission in the form of Demand Draft favoring SASTRA payable at Thanjavur. Rs.10, 000.00 development fees for a one-time payment. Exam fees will be extra based on the number of courses. The fee paid is not refundable under any circumstances. The programme comprises 60 credits. Note: The student has to secure a minimum of 50% in aggregate (Continuous Internal Assessment + TEUE) to pass a single programme. Six days Counselling session, which is optional, subject to change will be held at the study centers during weekends and during holidays. The Coordinator of the study center will decide on the conduct of the session and intimate the counseling schedule. The counseling session will mainly focus on giving clarification through active interaction with the students. If the number of students attending in a particular programme is less than 25, the counseling sessions/schedule will be canceled.